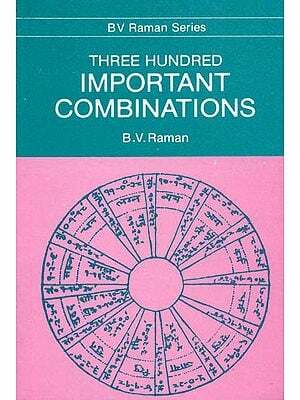 Great savants of astrology have enunciated various rules theories & hypothesis about various permutation & combinations of planets in a native’s chart. The 12 houses represent the journey of a native from the cradle to the grave. No two natives are identical even the twins differ. Why & how it happens is to be understood & explained by an astrologer. The basic rule is to proceed from known to unknown to understand the highly complex treatises. This necessitates the availability of a large number of horoscopes on which the various tools of astrology can be tested & understood. 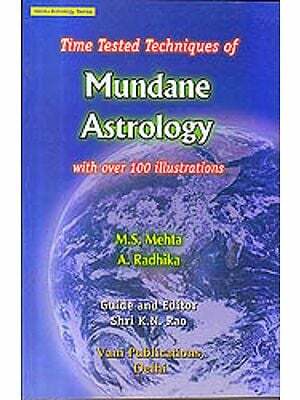 The book provides this basic necessity of large number of keen students & research scholars of astrology. This book provides horoscopes of nine divine deities of different religions and 756 horoscopes of different natives of different nations. 415 native out of them are alive as on date. To facilitate proper identification the charts of natives are given in alphabetical order. To facilitate further separate index have been given Lagna wise and profession wise. Total numbers of vocations have been identified as 27. Each horoscope gives longitudes in degree & minutes birth details of the native balance dasha at birth date & mode of death where applicable & available and few important events of each native. The scholars can derive much more useful information from the data given in the book. It is expected that large astrological fratemity will welcome the book in its present form. 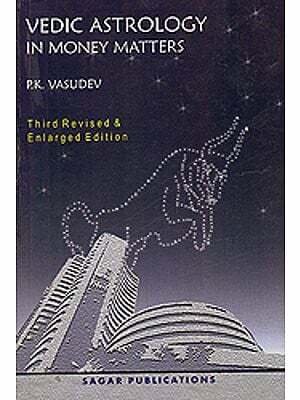 The author is a mining engineer from Indian School of mines now known as IIT Dhanbad. He has put in 28 years of service in the army as an engineers officer. He is a Jyotish Acharya from Bhartiya Vidya Bhavan. For a long time he has been pursuing astrological studies as a keen student. His researches reflect his analytical approach to go into the details as an engineer and then he put them across frankly as an Army officer. 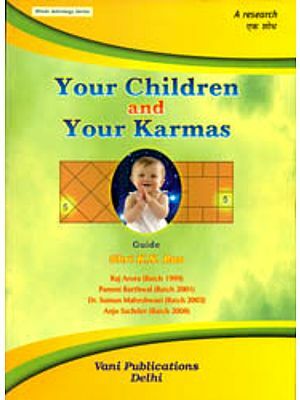 The author has earlier written books on Prashna: A Vedic Approach Vargas: A Vedic Approach, Charisma of Trika Houses, Astro Remedies: A Vedic Approach, Finance & Profession: A Vedic Approach, Longevity: A Vedic Approach and Charisma of Upshya Houses which have been received well by the astrological fratemity. Astrology has two main spheres of activities. The theoretical aspect covers various rules, hypothesis, yogas etc. as propounded by great savants of astrology over the ages. The practical aspect covers astrology as applied to analysis of natives' horoscope to convince & substantiate individuals about the efficacy of various tools of astrology as known to them. 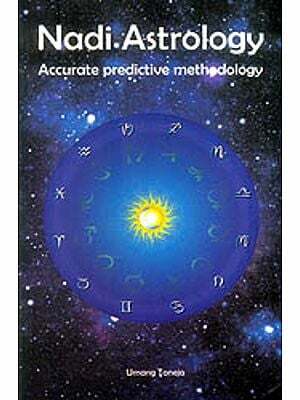 So the proficiency of predictive astrology is not complete without reference to both the above aspects. A keen student/ researcher of astrology will require a large number of horoscopes to test and apply various principles of astrology to ascertain their utility. This book provides this essential aspect for the benefit of keen students/ researchers and also for interest of general readers. Every individual, society or nation respects celebrities. Only some persons are gifted such qualities by nature which make them attractive/ repulsive to others. Then there are persons who find their way to success/ failure passing through unusual events. The analysis of their horoscopes makes an interesting study. Cartyle wrote," The history of the world is nothing but the study of great men". Therefore this makes them useful for general readers as well. 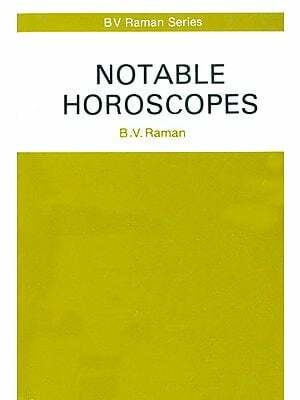 This book is a compilation of over 750 horoscopes that have excelled in various fields of life in different countries at different times. This has been a gigantic task with various problems attached. Firstly there is a definite lack of exact & authentic birth details available. Secondly in many cases, more than one set of birth details of celebrities are in circulation. Thirdly, at least in India, people are averse to their name & details being mentioned in any book (this has forced me to change the original names in some cases but keeping birth details intact). 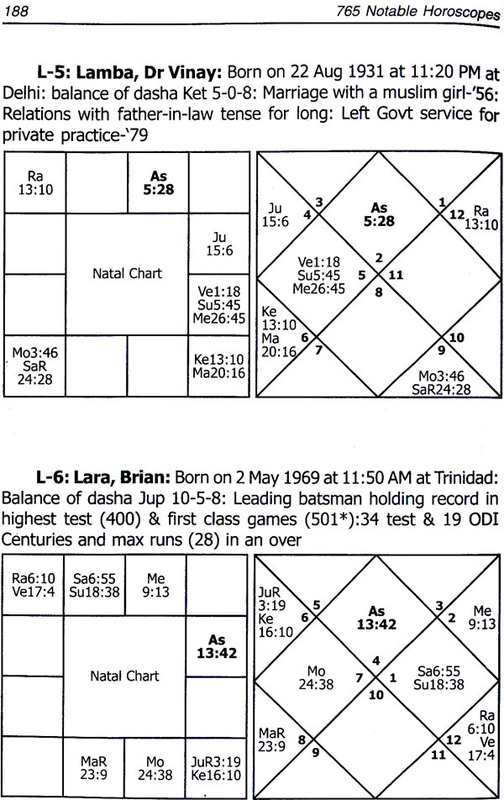 Fourthly, due to different Ayanamsa being used in various cases, there could be some difference in longitudes of planets/ Lagna. Lastly I have not met most of the natives personally and have compiled details based on various books, magazines or Internet. In view of the above, I will request the readers to bear with me any variation, if & when they notice and I will leave it to the readers to judge the truth for themselves. In this book the birth chart of important natives are given in alphabetical order giving date, time & place of birth with balance of Vimshotri dasha at birth in year- month-days: date & mode of death where applicable& available alongwith some important characteristics/ events of the native. This will facilitate correlation of the astrological principles and significations of characteristics/ events that occurred in a native's life on account of planetary positions. 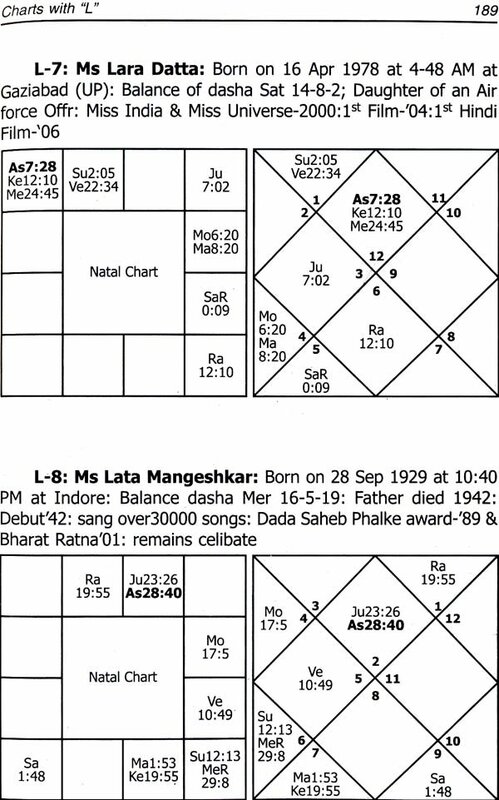 The birth chart indicates planets& Lagna (written in brief) alongwith their longitude in degree & minutes. The divisional charts like Navarnsha/ Dashamasha are not given to ensure brevity. However it is presumed that with the help of longitudes indicated, a student of astrology can work out relevant divisional chart where needed. In our mythology, great importance is given to the figure of 9. The human body is conceived as temple of God. There are nine ways to obtain God's grace through Navadha Bhakti. There are nine gateways to this body temple through which nine planets hurl down various aspects of life. The wise ancient sages observed that the above nine planets are related/ controlled by 27 constellations. Every one of us is subjected to constant electro-magnetic bombardment from these 27 constellations & nine planets, while we live in the sea of electro-magnetic waves.27 can be brought to single digit 9, which correspond to nine human systems- cardio- vascular, skeletal, muscular, nervous, respiratory, digestive, excretory, endocrine and reproductive systems. There are nine aspects of life (Nava Rasa) as propounded in literature. Nine is also represented by seven primary colours(VIBGYOR) and infra-red & ultra-violet. In Vedic culture 108 (12X9) also has a great importance as the rosary for worship has 108 beads. Therefore in the beginning of the book I have mentioned nine divine horoscopes. These are not normal horoscopes but are powerhouses of energy that control Kaal (Time) and have provided guidance /inspiration to millions of their devotees in their time of distress/ need. I salute each one of the nine divine deity with great reverence & faith with the humble request to always bless me and all readers of my books. For the same reason, I have included a total of 756 Horoscope which not only works to single digit 9 (756 = 7 + 5 + 6 = 18 = 9) but is also a multiple of 108 (756 = 108 x 7). Apart from the alphabetical index, the book also provides the profession wise (As per their fields of main activity) and Lagna wise index to facilitate the readers for futuristic study. The author is grateful to Dr Sanjeev Singhal who gave the idea to write this book and to my granddaughters Monil & Ishita singhal for their constant inspiration & for providing help of Internet. I would have loved to include the bibliography, but the sources of compilations are so many that it makes it very difficult. However I do appreciate the help provided by my friends-Mr Krishna Kumar & Col AK Singhal for their valuable contributions. I do admit that there is nothing original in this book; I have simply compiled the relevant data. I also acknowledge the help & support of Mr Narendra & Saurabh Sagar in timely bringing out this book. Let the "Vighna Vinayak" energise the contents herein and remove all the obstacles/ problems of the readers. I do hope that my present submission will be useful to keen students & researchers and will be appreciated by august readers and astrological fraternity, as has been the case of my earlier writings. I will request the august readers to let me know about their views and my mistakes/ omissions so that I can correct them in next edition.